Good morning! 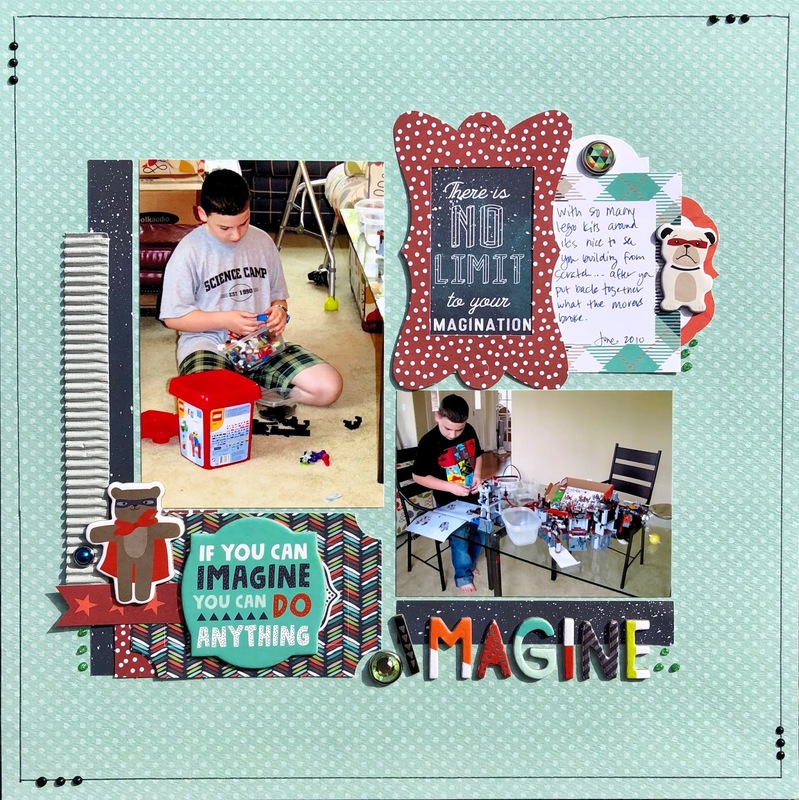 Today's article at Get It Scrapped talks about piecework in designing scrapbook pages, similar to piecing together a quilt. I really struggled with this design option. I started with 3 Columns/whitepace, but wound up feeling more comforatbale with the Vertical Axis piecework design. I only had 2 photos and this option enabled me to use embellishments in the opposite corners to balance the photos. I use similar designs often, but when I began thinking about it here, it became a roadblock. I overthought and I shouldn't have. When I've used this design before, I've used a large matte under the photos. Not using this one element really left me stumped! All of my son's Lego kit creations broke when we moved. He tried to put them back together, but gave up and went back to his imagination creating new ones from the bucket of pieces. I couldn't think of a better choice than Echo Park's Imagine That. 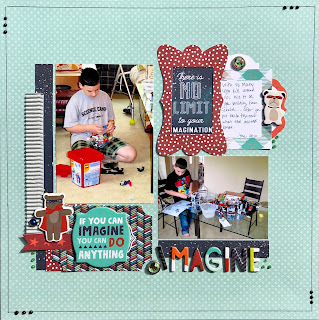 It's filled with all kinds of playful motifs you may find in a boy's imagination. You can find it at Paper Issues. Be sure you use DEVRA at checkout for 20 % off your purchase. Thanks so much for stopping by my creative view today. Come back again soon. I have more to share.